Concept of our method. 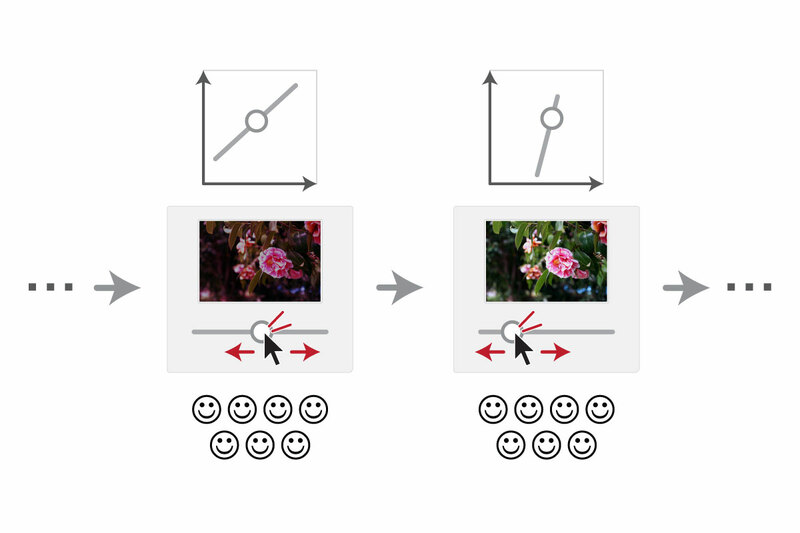 We envision that design software equips a "Crowdsource" button for running the crowd-powered search for the slider values that provides perceptually "best" design. To enable this, we present a novel extension of Bayesian optimization, where the system decomposes the n-dimensional optimization problem into a sequence of one-dimensional line search queries that can be solved by crowdsourced human processors. We demonstrate a new concept: crowd-powered visual design optimization. To find the best parameter setting in visual design (i.e., to optimize the design parameters), we utilize crowdsourced human computation. We decompose the original high-dimensional search problem into a sequence of one-dimensional line search problems. 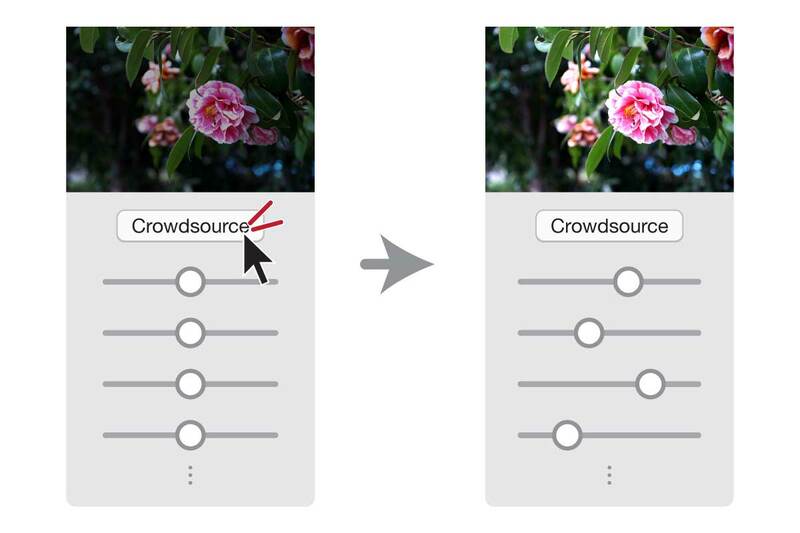 We ask crowdworkers to perform simple single-slider manipulation microtasks, which provide richer information than typical comparison-based microtasks. 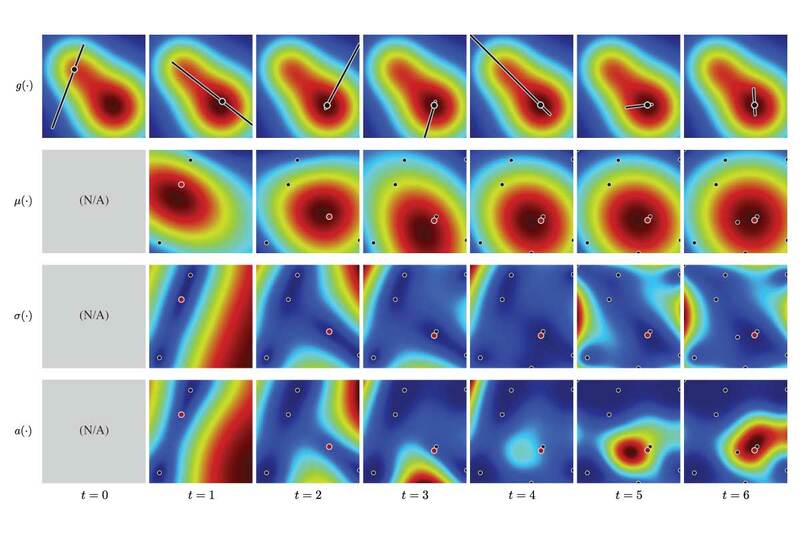 To enable sequential line search, we propose a novel extension of Bayesian optimization. While standard Bayesian optimization is based on function-value oracle, ours is based on line-search oracle and directly involves human in the loop. Our method is applicable to various design domains. As demonstration, we applied it to photo color enhancement (obtaining “people's-choice” good enhancement) and material appearance (obtaining plausible BRDFs from reference photos). Parameter tweaking is a common task in various design scenarios. For example, in color enhancement of photographs, designers tweak multiple parameters such as "brightness" and "contrast" to obtain the best visual impression. Adjusting one parameter is easy; however, if there are multiple correlated parameters, the task becomes much more complex, requiring many trials and a large cognitive load. To address this problem, we present a novel extension of Bayesian optimization techniques, where the system decomposes the entire parameter tweaking task into a sequence of one-dimensional line search queries that are easy for human to perform by manipulating a single slider. In addition, we present a novel concept called crowd-powered visual design optimizer, which queries crowd workers, and provide a working implementation of this concept. Our single-slider manipulation microtask design for crowdsourcing accelerates the convergence of the optimization relative to existing comparison-based microtask designs. 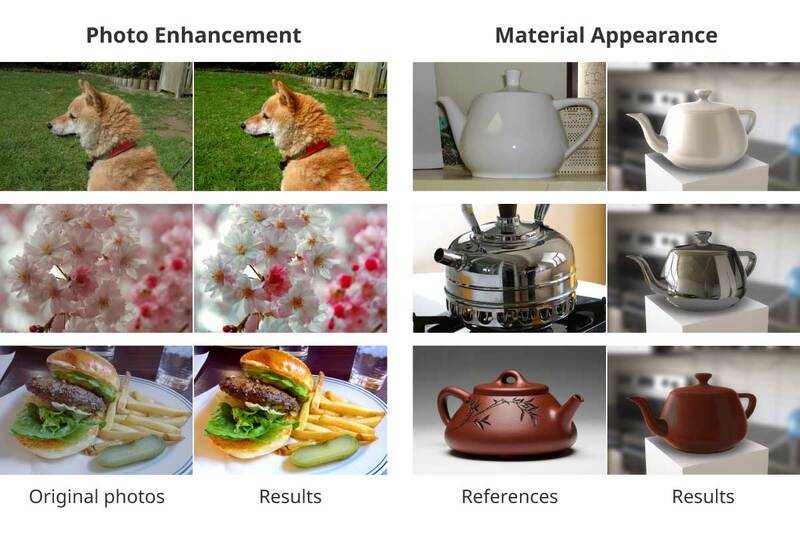 We applied our framework to two different design domains: photo color enhancement and material BRDF design, and thereby showed its applicability to various design domains. is a Researcher at AIST. He leaded this research project when pursuing his Ph.D. at The University of Tokyo. is a Lecturer at The University of Tokyo. He recently joined RIKEN as a Team Leader. is an Associate Professor at Hokkaido University. He was a Project Lecturer at The University of Tokyo when this research was conducted. is a Professor at The University of Tokyo.